He hasn’t put his game on display for over a year and his last PGA Tour win was in August of 2013 but the soon to be 41-year old has created lots of attention by saying he will play in a charity event October 10-11 followed by the Safeway Open October 13-16. And the company whose clubs he has played since 2002 is getting out, out of the club, bag and ball business to concentrate on shoes and apparel. 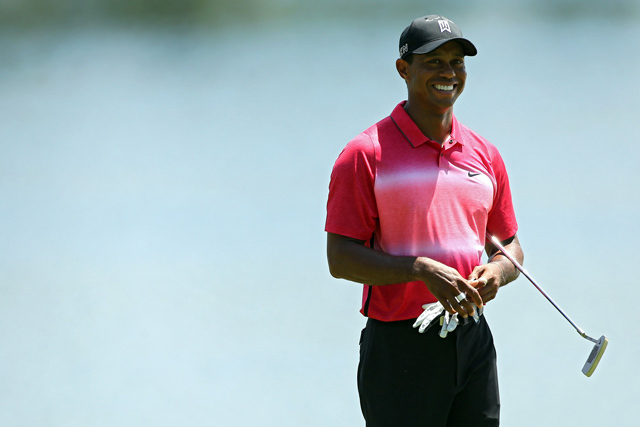 Tiger Woods and Nike, inseparable in the minds of many, have had an amazing run together. Woods currently has 79 Tour wins with 14 majors (not all using Nike equipment) ranking second all-time in both categories. Nike though, was never able to come up with a category-defining club in spite of having on the payroll Tom Stites, one of the most respected club designers in the business. What they did however, with Woods under the most lucrative contract in golf, was become the number one golf apparel brand. It’s no wonder, with the equipment business having at best a minimal-growth future, the decision to leave that arena was made. Woods and other staff members, most notably Rory McIlroy and Michelle Wie, will continue to wear Nike Swoosh apparel so they will still have a huge presence in the minds of consumers. Golfers just won’t be able to purchase Nike clubs. The effect the Nike withdrawal from selling equipment is uncertain but a good estimate is it probably won’t be very large. The golf division never had more than $800 million (last year $706 million) in sales but since the breakdown between hard goods and soft goods was not reported, actual club sales are unknown. They never approached a 10% market share in hard goods. Some in the media are saying Nike’s problems are because Woods hasn’t been playing and that’s incorrect. Nike didn’t have market leadership or even contend for leadership when Woods was at his best, winning multiple times in a season. His presence on Tour alone never could generate the amount of business Nike wanted to dominant the golf hard goods sector but did help push soft goods to the number one spot. Golf for Nike was a tiny part of their overall business, less than two percent, and several factors virtually preordained their decision. The small market share plus an industry where product lifecycles are measured often in months with relatively large development costs meant staying just didn’t make sense. It was obvious golf equipment had to go. With Nike paying more attention to golf performance and lifestyle soft goods, the biggest impact could be seen by competing shoe and apparel brands Acushnet’s FootJoy, adidas and Under Armour. Adidas is also leaving equipment and selling its golf brands TaylorMade Golf and Adams. The other major player Acushnet, owner of Titleist, is in the process of going public which typically can create uncertainly in corporate decision making. This could mean Callaway picks up the major portion of Nike club sales however large it was and undeniably Callaway has been on an upwards trend since Chip Brewer took over as CEO. Privately-owned Ping and others potentially could see a bump in sales as well. With all that in mind, which clubs will Woods switch to now that he plans to compete and again chase Nicklaus’ record of 18 majors? Well, it’s not clear he will switch at all and for sure not right away though Woods has said companies are sending lots of clubs to try out. He hasn’t played a Tour event since August 2015 and it’s unlikely he will make a club change soon. Additionally any equipment company paying the amount of money Woods can demand will want their logo prominently display on his cap and shirt so there’s an immediate conflict with his Nike apparel contract. Nike is worth several millions each year to Woods and the contract doesn’t renew until the end of 2018 so he’s not going to put it in jeopardy. One thing is for sure, fan interest will continue as will the speculation about Woods as he tries to get back to being top of the Tour.